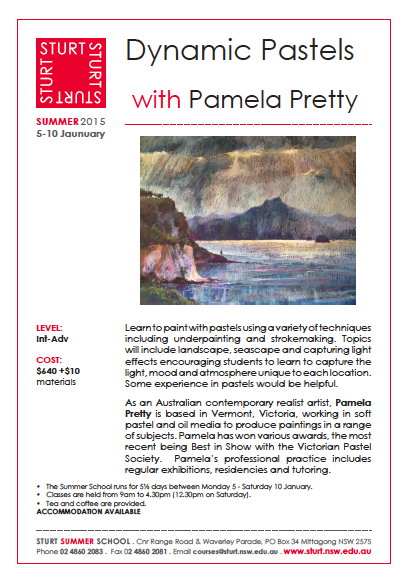 In the first week of September I will be running a 3 day workshop in the beautiful village of Latrobe in Tasmania. 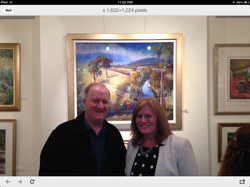 It is just a short flight from Melbourne so if anyone would like an escape from the city I would highly recommend this area and the hospitality of the host and hostess, June and Brian Wilson of the Crowded Lounge Gallery in Latrobe. I will be covering a variety of topics including underpainting in Schminke inks and using pastel to create some lovely effects. Accommodation is available at one of the B&Bs in the town (lovely from what I hear) and if you would like to book the dates are September 2nd, 3rd and 4th (Fri, Sat and Sun). Contact June Wilson on the Crowded Lounge Website www.thecrowdedlounge.com or ring on 0406772947 to discuss the details. These are WATERCOLOUR PLUS from 9-12 on Mondays and DYNAMIC PASTELS from 12.30-3.30 on Mondays. If you would be interested in joining the classes I would love you to join me so please ring me on 0419323923 and I will give you all the details. If you prefer to contact me by email my email is pamela.pretty3@gmail.com. 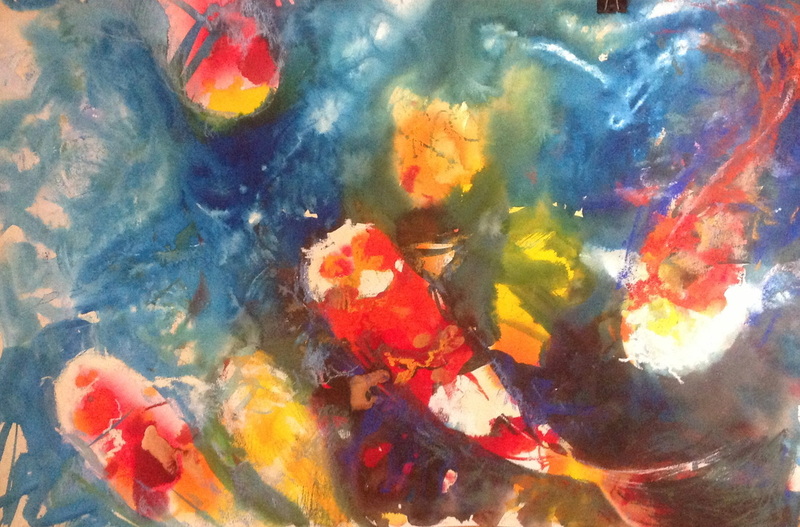 The painting below is painted with acrylic ink and pastel and is titled Koi 2. Come and join me in Mittagong, NSW for a week of amazing painting. For more information and details on how to be involved, see the flyer below. This year has been exciting with the PSVA show being judged by Terry Ludwig from the USA. The standard was very high and the overall winner was a worthy Rodney Edelston with an outstanding portrait. Runner up was Barbara Beasley-Southgate with a bush scene, beautifully rendered. My landscape was awarded best landscape. 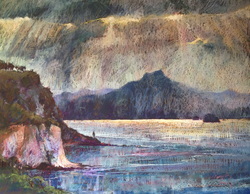 It is titled ENDLESS and depicts the plateau at Tongariro National Park with a storm hitting the mountain. I am very thrilled to announce that a selection of my paintings will be available at the Brialyn Boathouse Gallery in Frankston. 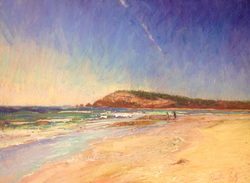 The Gallery has a marvellous selection of contemporary realist work and is situated on Nepean highway beside the cafe. It is my delight to announce that Lofty has won the Best Pastel at Camberwell Rotary Art Show with the judge being David Chen. I had the honour of receiving the award at the opening tonight and many thanks to the organisers and sponsor of my prize Deans Art. A creative fun workshop was held up at the Echuca Moama Art Society with a busy group of Artists Creating paintings with under painted surfaces.A big thank you to Canson for providing our paper for the workshop so we could try out the technique on Tex paper. What a creative group of ladies and gents! I can't wait to visit them again one day.photos coming soon! 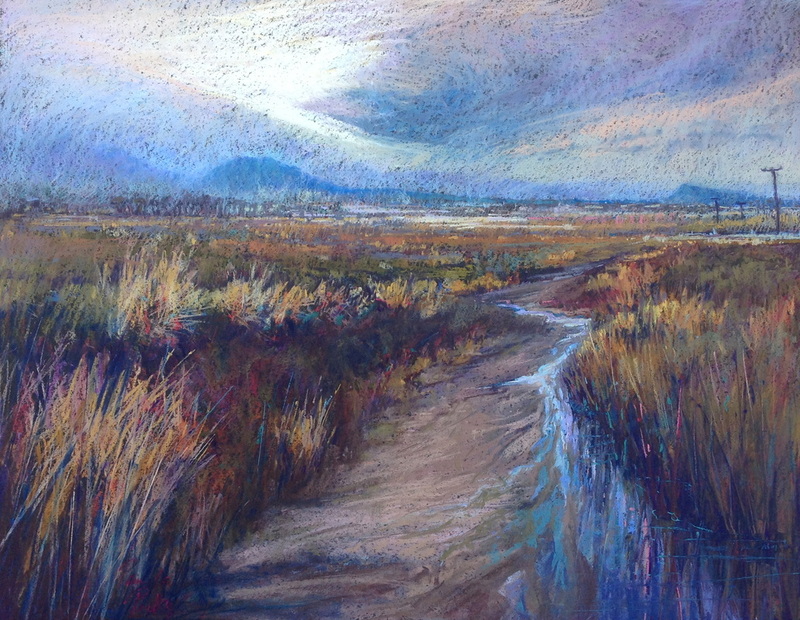 A new Year is beginning ….the perfect time to break out those paint brushes and pastels and explore your creativity! I have 3 classes running now so if anyone is interested in learning pastel, oil, drawing, watercolour or acrylic we cover all bases in one or another of the classes. I look forward to hearing from you! for 5 weeks from the 30th of October . For details see the download....Come join me to explore your creative side! Contact Kate on 8683 6903. 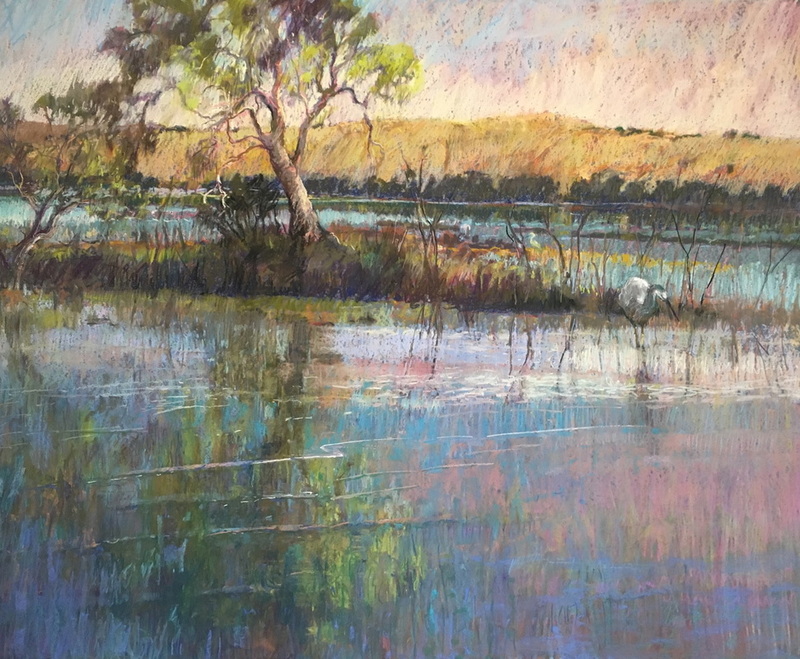 The 26th Pastel Society of Victoria Australia was held in August at AGRA Galleries in Camberwell. I was very thrilled to receive Best Painting in this exhibition with my landscape "Lofty". The Judge was Michael Goff and this photo was taken at the opening of the show with the judge. 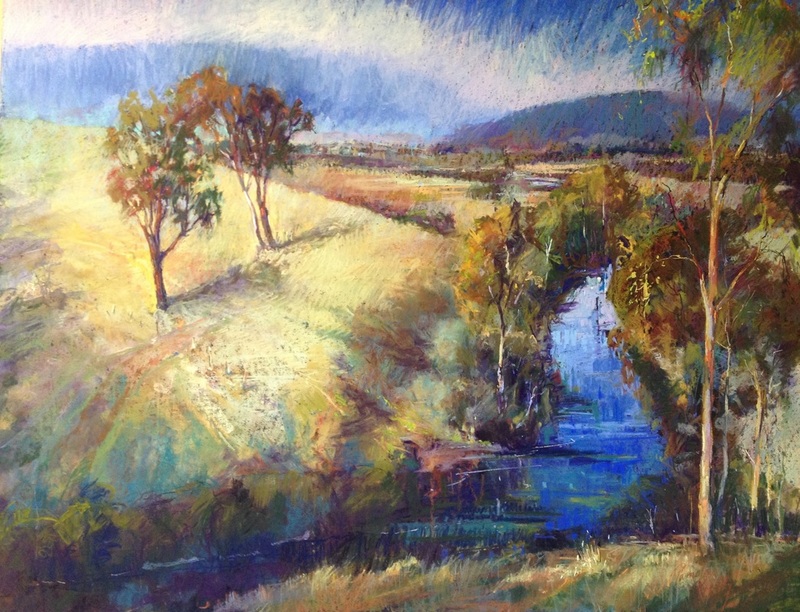 Author Pamela Pretty -a passionate plein air pastellist from Australia. 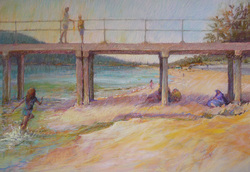 My Dromana painting- the image is a bit pale unfortunately. the title is "A View Through- Dromana 2011"